A new study has documented the astonishing distances covered each year by Willow Warblers breeding in the north-easternmost part of the species' range. 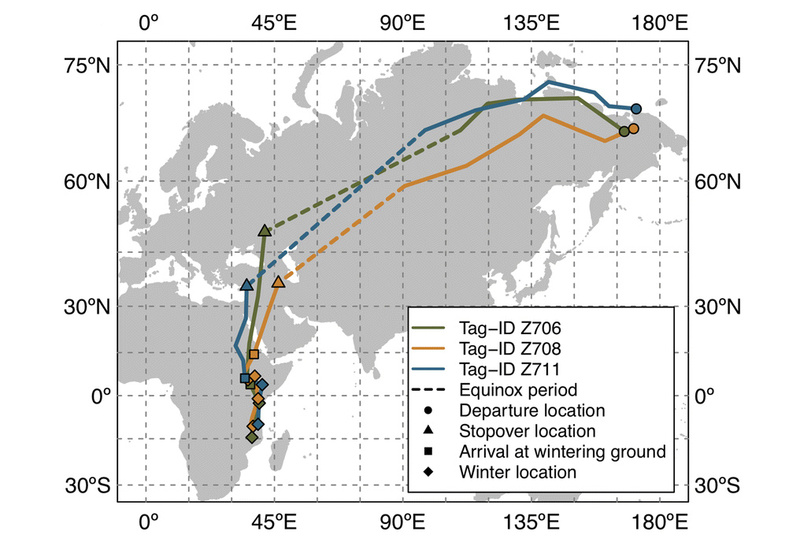 Using geolocators, the researchers tracked three male yakutensis Willow Warblers from their breeding grounds in Chukotka, Russia, to their wintering range in sub-Saharan Africa. They found that all three individuals were very similar in the routes they took to their final wintering sites in southern Tanzania or northern Mozambique, in their use of stopover sites in south-west Asia and in the overall timing of migration. In total, this southward migration route amassed to a distance of between 12,000 and 13,000 km – one of the longest among songbirds, despite the warblers weighing less than 10 g.
The study found that male yakutensis Willow Warblers complete a 12,000-km autumn migration in as little as 93 days (Marc Fasol). The Willow Warblers initially followed a north-west migratory route when leaving the breeding area, and after crossing the initial longitudes, the routes were gradually directed more towards west and south-west until they reached the first stopover site. The end of this initial part of the migration occurred during the autumn equinox, with data suggesting a slow but continuous migration, with one bird showing a potential stop lasting only a few days. After the main stopover period in south-west Asia, the birds changed to a southerly migration route, along which they reached the wintering sites in Eastern Africa. The passage farther south in East Africa followed at a very narrow longitudinal range for all birds. In total, it took the warblers between 93 and 118 days to complete their epic migration from the Russian breeding areas to the first sub-Saharan stopover site. The full paper is open access and can be read online here. Above: Autumn migration routes and stopover sites of three male Willow Warblers tracked by geolocators from north-east Russia to south-east Africa in 2016-2017. The autumnal equinox period (two weeks before and after 23 September), is indicated as a broken line for each track. Graph adapted from Sokolovskis et al. Sokolovskis, K, Bianco, G, Willemoes, M, Solovyeva, D, Bensch, S, & Åkesson, S. 2018. Ten grams and 13,000 km on the wing – route choice in Willow Warblers Phylloscopus trochilus yakutensis migrating from Far East Russia to East Africa. Movement Ecology 6:20, DOI: https://doi.org/10.1186/s40462-018-0138-0.